You won't find a table for two at a Lebanese restaurant. This is a cuisine that's made for sharing, where the surface of even the most capacious table is made to work down to the last inch. The abundance of mezze dishes that come in waves make the measured approach of other nationalities seem just a little bit mean. Lebanon is undoubtedly a food culture, a beguiling destination for lovers of life and one that changed the late Anthony Bourdain. "Hopefully, you will come back smarter about the world. You'll understand a little more about how uninformed people are when they talk about that part of the world. You'll come back as I did: changed and cautiously hopeful and confused in the best possible way," he said after filming an episode of No Reservations when the 2006 Israel-Hezbollah conflict broke out. He got it – Lebanon can be confounding; Beirut, the capital, appears chaotic at the surface, but with a little exploring and after few meals it reveals a passionate heart between layers of complexity. It's a compact country with great diversity. Within less than two hours you can touch snow in the mountains, then dip your toe in the Mediterranean. Dishes vary just as widely, it's baba ghanoush as you know it in Beirut, but a dish that more closely resembles salad as you near Syria. The cuisine invites exploring and comparing between regions and delving into its many culinary nooks. It's a layer cake of influences, reaching as far back as the Ottomans to the influx of Armenian refugees who fled genocide in 1915, and more recent arrivals from Palestine and Syria. Armenian dishes such as mante – tiny baked meat-filled dumplings – are now part of the culinary landscape. But there are surprises from further afield. In the Chouf mountains you'll see mate (matcha), which was brought by the Druze from Argentina; and tannour (tandoor) ovens in Baalbek, with huge rounds of flatbread slapped to their insides. There's intrigue in variety, with easily more than 10 different breads in all shapes to try, and cheeses that demand attention: from salty, stringy, braided majdoul, through to gooey warm knafeh that's sweetened and stuffed into a pocket of ka'ak bread for breakfast, or eaten savoury later in the day. The weaving of food as the fabric of daily life starts long before it reaches the table. Symbiotic relationships connect baker and butcher, customer and vendor. You can take your favourite zaatar blend to the local manoushe (flatbread doused in olive oil) maker because that's how you like it. The country is in an interesting space as it straddles the old and the new. Prosperity has stuttered and surged through periods of strife and calm and Lebanese who have made their mark and money overseas are returning to pick up where the previous generation left off, halted by civil war. Some shoulder the beauty and burden of inheritance, a historic family home that needs restoring; a piece of land that needs honouring. Meanwhile, others have stayed, safeguarding tradition in innovative new ways. Common ground is found in the kitchen and I think we need more of it today. A recent returnee is Bethany Kehdy, whom Yotam Ottolenghi describes as "a new champion of Middle Eastern food". 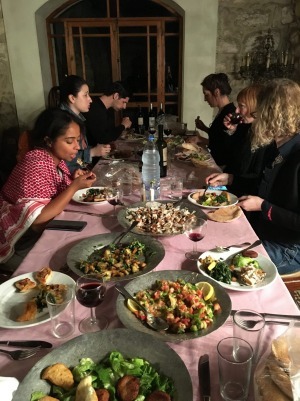 Previously based in England, the cookbook author returned to Beirut in May and promptly launched her Mawsam supper clubs at the home she shares with her two sisters in hip Gemmayzeh. Beneath a chic chandelier from Syria and at a two-metre table, an antique door from Tripoli, she serves an ever-changing dinner menu for 10 to 12 people ($99, @swingingmawsam). And since 2009, she's been running Taste Lebanon, must-do walking and eating tours of Beirut that will give you essential culinary and geographical knowledge, as well as rural and cultural tours. Maher Harb of Sept Wines is another returnee. The former econometrics guru left a career in France to grow grapes biodynamically on the rock-wall-lined terraces he inherited from his father in the hills of Batroun. The yoga-pants-wearing rugby player feels he's finally paying homage to his father, who died in the war. His labour of love led him to hand-press his first syrah harvest into a silky smooth 2016 vintage. As well as hosting wine tastings, Maher and his mother cook charming lunches in their home garden for a maximum of 15 people ($80 each, levinsept.com). Kamal Mouzawak is a celebrated culinary hero who has stayed, building social enterprises that preserve traditions and promote peace and prosperity through food. Whereas you are more likely to see men preparing food in the public domain, Mouzawak works with home cooks from all over the country, women who prepare dishes that have been in their families for generations. He brings together people whose lives have been affected by war, Lebanese and refugees (the country counts more than 1.5 million within its borders, most from Syria, and many from Palestine), to cook together, dissolve cultural and religious differences and promote entrepreneurial independence. "Common ground is found in the kitchen and I think we need more of it today," says Mouzawak. A rotation of new and established cooks prepare lunch at Tawlet (soukeltayeb.com/tawlet), the "farmers' kitchen" he opened in 2009 in Beirut's popular Mar Mikhael. He's taken the concept to other parts of the country and has opened his family home in Douma as accommodation, an exquisite taste of his generous hospitality. Stimulate the appetite in Beirut (see below), then plot your route to explore the forested Chouf, where a stay at Bkerzay (bkerzay.com) is essential for its stylish, earthy calm and food by Beirut-based chef Hussein Haddad, who picks up on the area's Druze influences. The Bekaa Valley beckons for its wine, and Douma calls for a stay in a traditional Lebanese home, some of them still with original frescoes painted by Italian artists, and with gardens laden with apricots and cherries. Visit Ba'albek for some of the most astounding Roman ruins you'll see, but without the queues and crowds of the Colosseum; and dip into the city's food alleys where men work like supple machinery to make sfiha, moreish mince encased in pockets of pinched dough that's baked in flaming ovens. Frenetic Tripoli has its narrow souks lined with spices, olives, vine leaves and street carts selling towers of freshly baked bread and pyramids of garlic destined to be whipped into addictively pungent snow-white toum. But if you don't make it there, seaside Saida, just south of Lebanon, is a smaller, calmer option. Both destinations are predominantly Muslim and you'll find trays of syrupy nutty sweets and freshly made Turkish delight that make up for the sugar content others get from wine. In tiny, cave-like shops in both souks, you'll find artisans preparing sweets as has been the way for centuries. There's perfection in simplicities presented at the Lebanese table. A salad of pomegranate kernels sprinkled with rosewater and pine nuts; carob molasses swirled with tahini (think Arabic peanut butter and jam); a bowl of cherries at breakfast that crosses the border between a sweet, sticky jam and a dessert. 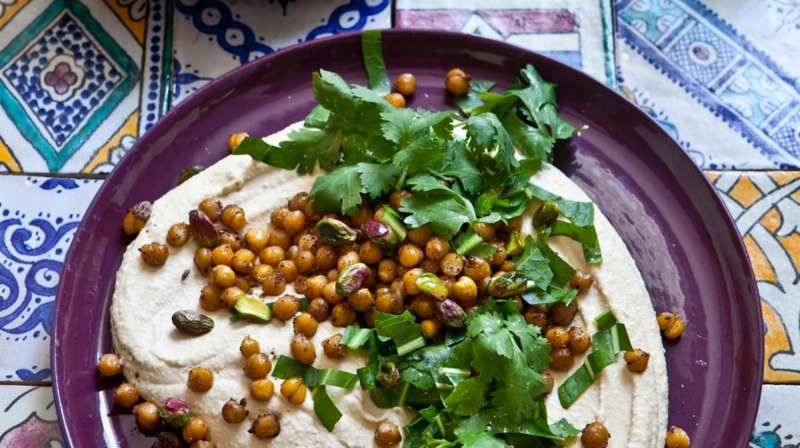 You'll leave picking the persistent green remnants of tabbouleh from your teeth, and with a hankering for the ultimate hummus and respect for the culinary wizards who whip it to perfection. Traditional Lebanese cuisine is given a contemporary update in the chic surrounds of a restored 19th-century Ottoman palace. Well-known flavours from the Levant and Mediterranean are given thrilling new twists here. Lebanese mezze, Armenian and Moroccan dishes are served to an artsy, intellectual crowd in upscale Hamra. In the downtown area and Hamra, Aboulziz serves the best falafel sandwich in town, with light, fluffy, crunchy falafel wrapped with crisp fresh and pickled vegetables. Add a pickled chilli from the counter for a touch of heat. Carefully selected guesthouses and boutique hotels in Beirut and beyond come under the hotelibonais.com umbrella.